The common thread connecting all cult movies is their singularity, born of a filmmaker’s resistance to the hackneyed formulas and assembly-line processes of the major studio. Of course, it’s much easier to be an iconoclast off the lot, which is why the vast majority of New Cult Canon titles were produced independently or in a country other than America. That goes double for Hollywood animated movies, which are by necessity a factory endeavor; in thinking about some American films to include in Animation Month, it occurred to me how few truly personal visions have managed to squeeze through the system. That isn’t to say that the contemporary animation scene isn’t vital; quite the contrary. But the major efforts have more of an institutional stamp than a personal one: Think about Pixar, Aardman, or Katzenberg-era Disney, and the distinguishing features are varied and unmistakable. But locating a single, guiding force behind any one of their movies, while not impossible, isn’t nearly so easy. There are a handful of outliers I considered for this column—most notably The Emperor’s New Groove, a wonderfully rambunctious orphan in the Disney catalog—but I eventually settled on Brad Bird’s The Iron Giant, an enduring little hiccup in the natural order of things. Coming out of Warner Brothers animation, which hadn’t (and still hasn’t) found an identity since its Looney Tunes heyday, the film stubbornly refused to conform to the industry standard. It’s a smoothly integrated hybrid of hand-drawn and computer animation, but with a look that leans decisively toward the former—it sports a simple, warm, retro style that was markedly out of fashion in the rush to CGI. Missing also were the requisite song-and-dance numbers and snarky pop-culture references in the dialogue, replaced by an austere music score and a take on Eisenhower’s America that brims with gee-whiz earnestness. In other words, merchandising opportunities were limited at best. The Iron Giant flopped in 1999, leading Warner Brothers president Lorenzo di Bonaventura to shift the blame on the presumed box-office folly of bankrolling “smarter family movies” rather than on his studio’s ineptitude in rolling it out. (The film was sandwiched between Quest For Camelot and Osmosis Jones, to give you an idea of Warners’ dysfunctional feature-animation division.) Granted, a pacifist morality tale set during the height of the Cold War sounds more like a trip to school than fun for the whole family. But at its core, The Iron Giant is basically E.T. in reverse: same starry-eyed story of a boy befriending an alien, only here, it’s the boy’s simple wisdom that makes an impression on the alien, not the other way around. And while there’s no single image in The Iron Giant to match the iconic shot of children cycling in silhouette under the moonlight, there isn’t much difference between that flight and a young boy cradled into the palm of a 100-foot-tall robot, catching a bird’s-eye view of a seaside town in New England. The bond between boy and alien may just transcend the bond between boy and dog. The opening shot glides past the Soviet satellite Sputnik as it orbits around the Earth; already, all demographic charts have been thrown out the window. Parents (or more likely, grandparents) might recall what life was like during the Cold War, or at least have some historical reference, but 1999 was still a full decade after the Berlin Wall went down, so those tensions are completely lost on the little Johnnys and Jennys in the audience. To the average (or not-so-average) kid, the scene in 1957, when the film takes place, doesn’t resemble their world in the least, even though Bird and screenwriter Tim McCanlies—drawing only slightly from the children’s novel The Iron Man, by British poet laureate Ted Hughes—have found other ways to connect with the very young. Kids don’t need to know a thing about the arms race, beatniks, or “duck and cover” educational propaganda to grasp the simple themes of peace and friendship at the film’s heart. But those elements are there for their parents; rarely does family entertainment work several steps up the generational ladder. On a stormy night in 1957, the ginormous robot (voiced by Vin Diesel) of the title comes blazing through the sky like an asteroid, crash-landing in the water outside the seaport town of Rockwell, Maine. Meanwhile, a 9-year-old latchkey kid named Hogarth (Eli Marienthal) is up late watching science-fiction movies on television while his single mother (Jennifer Aniston) works late at the local diner. When the signal goes out and Hogarth heads up to the roof to investigate, he’s the first to spot the alien in a forest clearing, and with little but a BB gun and a flashlight, the intrepid boy sneaks off to take a closer look. The two become fast friends when the robot’s insatiable appetite for all things metallic leads him to a power station and Hogarth saves him from electrocution. Odd as it sounds, Hogarth winds up as the robot’s protector, but how long can he keep this 100-foot, steel-chomping marauder a secret? Bird has a lot of fun with the overheated paranoia of the day, with newspaper headlines like “DISASTER SEEN AS CATASTROPHE LOOMS” and a clever send-up of silly “duck and cover” solutions to the atomic threat. (As we learned from Indy 4, a refrigerator is the only household item capable of withstanding a blast of that magnitude.) While limiting the giant’s expressions almost entirely to his eyes and mouth, Bird and his animators create a subtly expressive creature who’s even more childlike than Hogarth, a gentle blank slate who’s as open-minded and impressionable as an infant, and every bit as playful. Yes, he’s been programmed for mass destruction under certain circumstances, but he comes to Earth as an uncorrupted, deeply impressionable innocent. To that end, one of the great things about The Iron Giant is that it turns the science-fiction monster movie on its head. This is not The War Of The Worlds, where the human race heroically battles an alien beast with powers beyond their comprehension and capabilities. Though he may have been designed to wipe out the planet one metropolis at a time, the robot is a weapon that doesn’t know he’s a weapon; in fact, the film boldly refuses to explain his origins or original purpose. Once on Earth, he’s a defensive threat, naturally inclined toward peace unless guns (even Hogarth’s toy ray-gun) are pointed in his direction. He answers aggression with equal force, and in doing so, becomes a simple reflection of our futile and self-destructive impulse toward violence. To put it in Cold War terms, he’s the ultimate deterrent, not quite on the same scale as the dreaded “Doomsday Machine” in Dr. Strangelove, but certainly in the same spirit. Fire bullets and missiles in his direction, and hellfire will come raining down on your head. 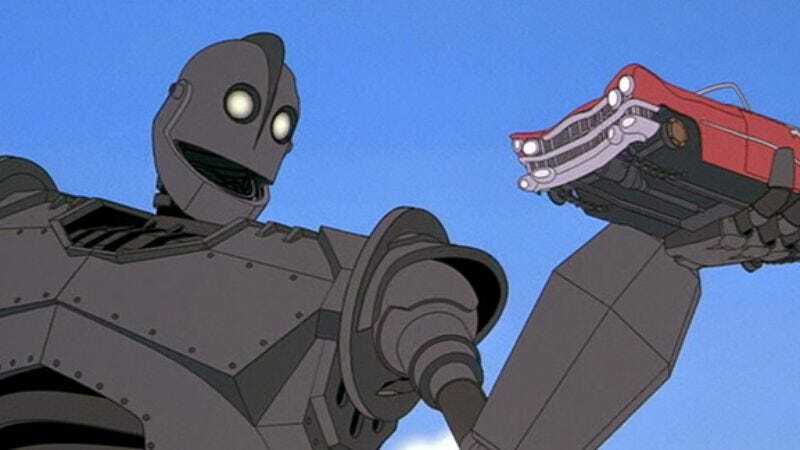 Though the film is rightfully beloved in most corners, the chief knock against The Iron Giant is that it views the Cold War era through the politically correct lens of the ’90s. That’s true to the extent that hindsight can soften and make ridiculous the very real atmosphere of mistrust and paranoia that dominated the period. But if Stanley Kubrick could see through the unproductive, dangerous saber-rattling between the U.S. and the U.S.S.R. as far back as 1960, then surely Bird can take the same license without being slagged as a naïve peacenik. Though the film mocks the elevated extremes of the Red Scare, it by no means brushes off the seriousness of a world nearly driven to the brink of catastrophe. It’s as serious as an animated adventure about a boy and a robot can possibly allow itself to be. Messages of non-violence are easy enough to come by in animated movies, but other lessons in The Iron Giant are considerably more radical. Though it can be hard to read the subtext in Bird’s movies—for all of The Iron Giant’s leftist readings, his subsequent effort for Pixar, The Incredibles, was viewed by some as a right-wing screed—this film has a healthy anti-authoritarian streak that’s rare in children’s entertainment. Here, the beatnik is a hero and the square-jawed, Eliot Ness-like government agent is a villainous buffoon. (And hooray for single mothers, too: Hogarth’s mom works night and day, and still teaches him enough about right and wrong to save the world.) In an environment where most movies of its kind have a different message—i.e. “buy me in plush or action-figure form”—The Iron Giant chalks one up for progressive parenting.